We’re Glen and Robyn, two South Africans who have been living and working in London since the late 2000s. We grew up eating traditional Biltong as a healthy, delicious snack, making it with our families back in Johannesburg. But getting hold of authentic, high-quality Biltong this far from home was difficult. It was dry and tasted like cardboard – nothing like the mouthwatering Biltong we knew and loved. In 2011, we started on this journey quite unexpectedly. We’d reached a point in our lives where we felt it was time for a bit of a lifestyle overhaul. Joining a gym, we were put on a new exercise and healthy-eating regime by our personal trainer. It was brutally tough, but really rewarding. One of the biggest challenges we faced was getting the right levels of healthy protein into our diets - until we realised the solution had been staring us in the face. Biltong! We began making small amounts of Biltong at home – but with a twist. We would only use the best ingredients: super-lean British grass-fed beef, organic spices and red wine vinegar. We bought a specialist drier, made some small batches to our own unique recipe and shared them with our personal trainer. He loved them. Word soon spread throughout the gym and soon one order grew into hundreds. 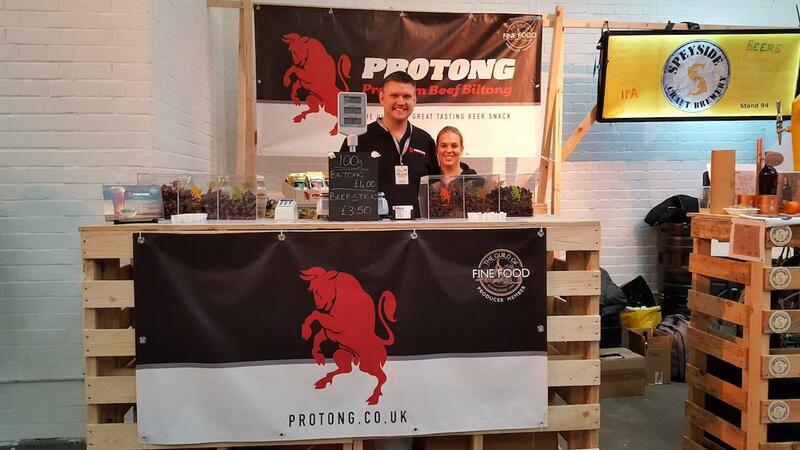 We realised we had a great business idea and Protong Biltong was born. Since then, we've built a bespoke Biltong factory to bring you a range of great tasting snacks, all hand-made to our own bespoke recipes, with premium beef, authentic ingredients and love. No gluten, no junk, full of taste. We’re incredibly proud of Protong Biltong, and can’t wait to hear what you think of our traditional-with-a-twist South African snack. Do drop us a line..